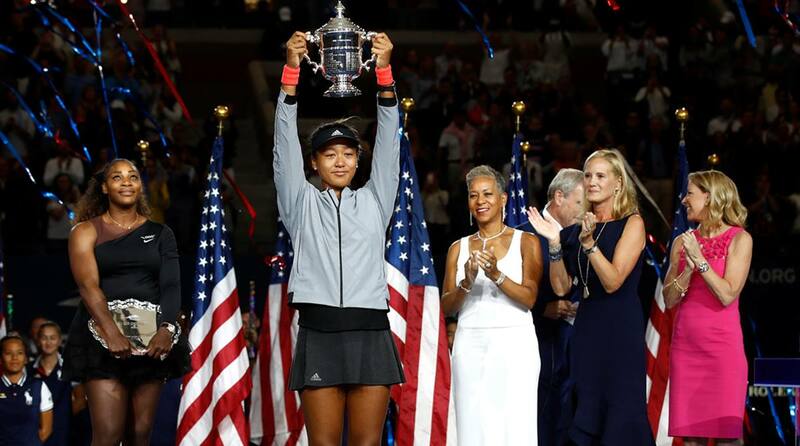 Naomi Osaka, all of 20, became the first Japanese to win a Grand Slam singles title on Saturday as she beat her idol Serena Williams in the final marked by angry outbursts by the latter who was penalised a game for code violations. Williams called the chair umpire in the US Open final “a thief”. Osaka’s 6-2, 6-4 win was deprived of the attention this historic moment deserved as the talking point remained the drama that was witnessed at Flushing Meadows as Williams repeatedly took on umpire Carlos Ramos. With both players chasing history, the match was tense from the beginning. Osaka got a 2-1 lead after Williams double-faulted on break point. The young Japanese kept her hold and broke again to lead 4-1. Silencing the crowd, Osaka went on to win the set 6-2. Trouble began during the second set, when Ramos warned Williams for receiving coaching from her box, which enraged the American who vigorously denied the charge. Williams was up 2-1 on the changeover, and broke Osaka for a 3-1 lead. The 20-year-old, however, broke back as Williams double-faulted twice and netted a backhand. That was then the American smashed her racquet to the court, inviting a second code violation. Handed a point penalty, for racquet abuse, Williams exploded. “I didn’t get coaching. I haven’t cheated in my life. I stand for what’s right,” she Williams as they headed into the sixth game. A point penalty meant Osaka was to start the game 15-0 even before the first serve. Osaka soon broke for a 4-3 lead, even as Williams continued her verbal assault on Ramos. Tearfully, she accused Ramos of being a “thief” for “stealing a point” and angrily demanded an apology from him. Osaka’s score now stood at 5-3 (from 4-3), keeping her just one game away from victory in the second set. Williams won the next game, even as she remained tearful, arguing with a supervisor. Williams, seeking her first title since she became a mother last year, was denied a 24th Grand Slam. The stadium was full of Williams fans and they started booing during the trophy ceremony. Both Williams and Osaka were in tears when the senior player took to the mic. An overwhelmed Osaka seemed to be at a loss, and ended up apologising to the crowd. “It was always my dream to play Serena in the US Open finals,” she said. “I’m really grateful I was able to play with you, thank you,” Osaka added, turning to Williams. She added: “When I turned around it was 5-3 so I was a little bit confused then,” she said of the game suddenly awarded to her.